Gundam was arguably at it’s highest point in the US during the airing of Gundam Wing, and one of the memorable moments was the airing of Gundam Wing Endless Waltz on Toonami. 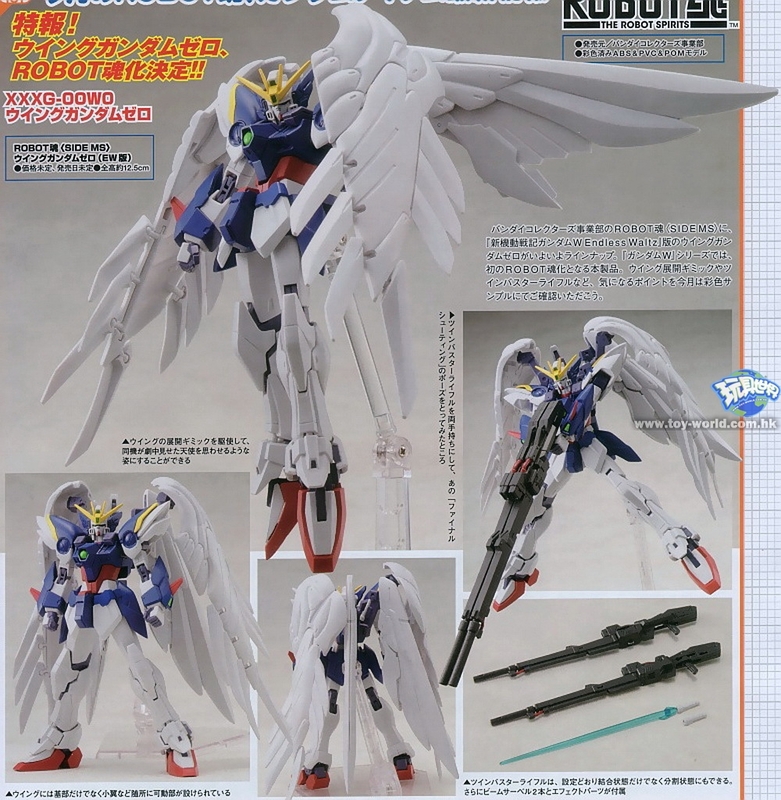 Since then Bandai‘s Gundam action figures have evolved, with the latest series Robot Damashii SIDE MS having become a popular line, one which was surprisingly absent of mobile suits from Gundam Wing. 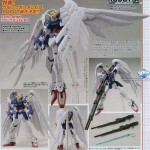 Now perhaps you’ve seen the Wing Gundam Zero Custom from SIDE MS in our Toy Fair 2011 Various Japanese Toys And Figures post. Get ready to see more as we have a new scan of this upcoming figure via Toy-world.com.hk, check it out after the jump! Oh I definitely know who I'm gonna call! Nice. I may have to start these in my collection. I was on board until the pink thong was revealed. Ugh. So tacky. Very disappointed. I was looking forward to owning a hot Ghostbuster, sorry Peter, Egon, Ray and Winston. Out of everything provocative about this statue, and the appearance of a pink line on the hip is what constitutes a deal breaker? So, is she just a random girl in a ghostbusters suit? Or if she supposed to be that woman with the glasses from the movie? I guess she was the secretary? I don't really know if it's suppose to be anyone in particular, but if you put a pair of glasses on her...She could pass for her. To be fair, the pink does kind of stand out a little too much. Maybe if it was a muted shade it'd blend better. Or black. If the thong were black it would have looked fine. 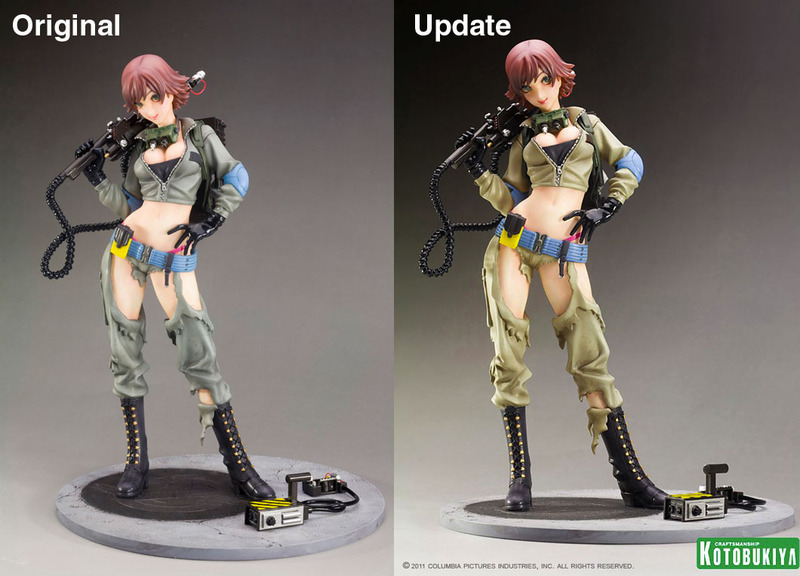 If someone asks you if you want a Kotobukiya Bishoujo Ghostbusters Statue, you say, "Yes!" I prefer the original, but to be honest, if I hadn't seen the side by side comparison, I probably wouldn't have noticed the difference. I see absolutely no difference there. Even with the side-by-side picture. The shade of green? I'm lost. I want this so bad.. The eyes are off-putting.. but everything else is... I don't know, I feel like I need a cold shower. Having said that, she'll look right at home next to Lunamaria. All times are GMT -4. The time now is 8:17 PM.